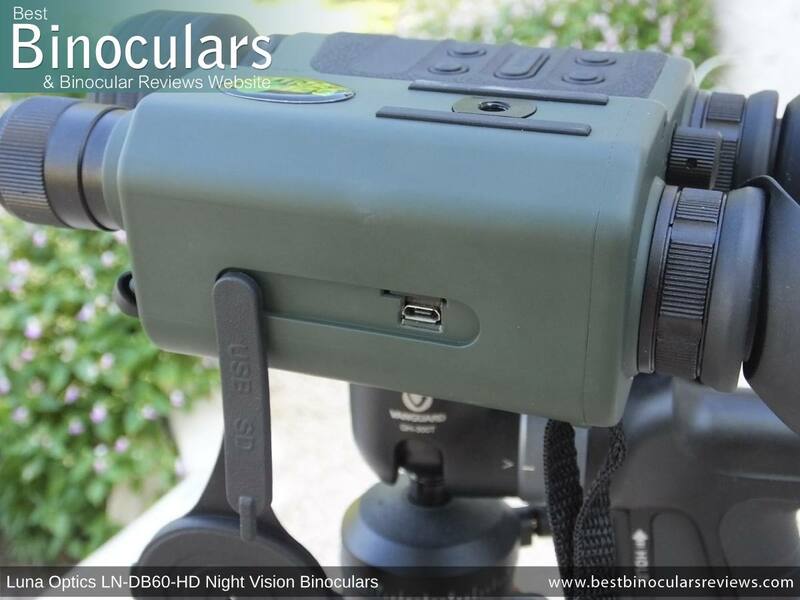 The LN-DB60-HD is the top-of-the-range Digital Night Vision Binocular from Luna Optics, which is impressive in itself, but it is actually much more than that. 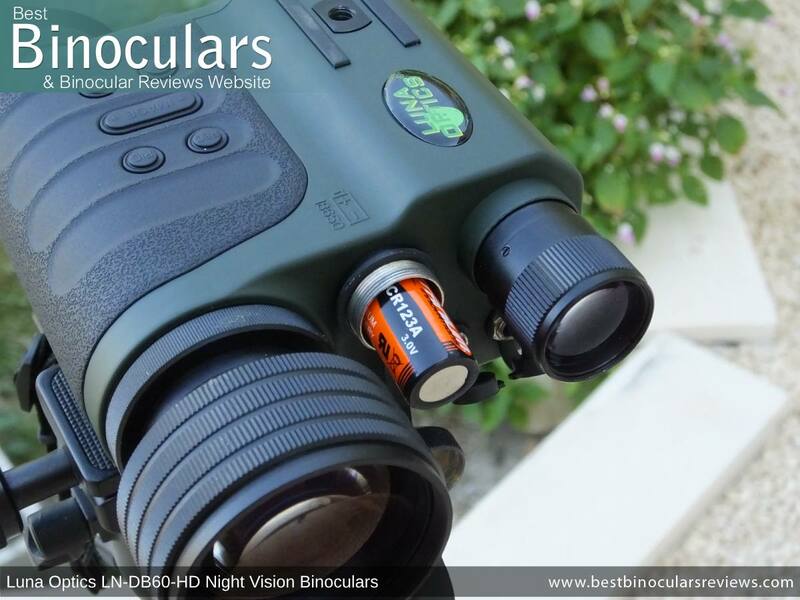 This is because as well as enabling you to see at night, and unlike standard NV that use intensifier tubes this unit can also be operated during the day and in addition it to this, it is even able to capture both image and video in full HD quality. 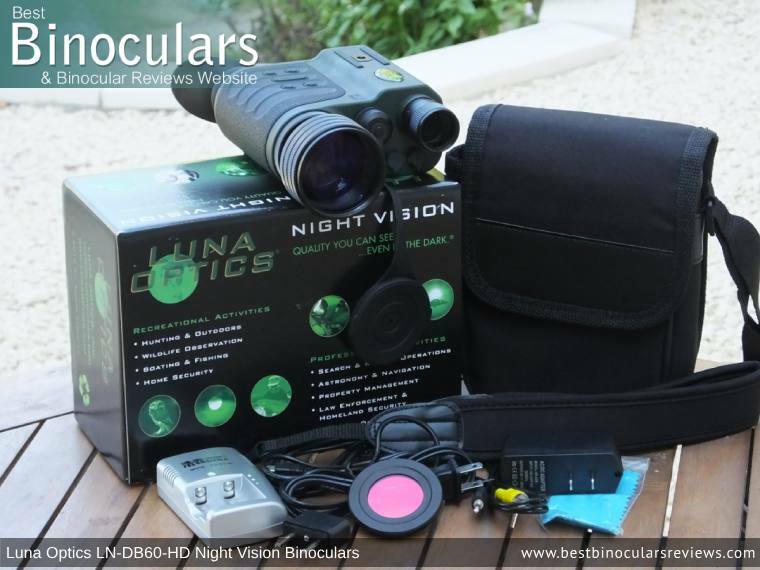 So I guess if you were trying to be more accurate, you'd probably have to call it the Luna Optics LN-DB60-HD Digital Day & Night Vision Binocular and Recorder! When in its infancy, Digital Night Vision was considered to be far inferior to a good quality analog tube instrument using photocathodes and phosphor screens. However as with everything, digital technology has progressed and there are now many devices that are not only far less expensive, but are also able to match and in some cases even surpass the resolution that you get from a military / law enforcement grade Gen-III Night Vision device. 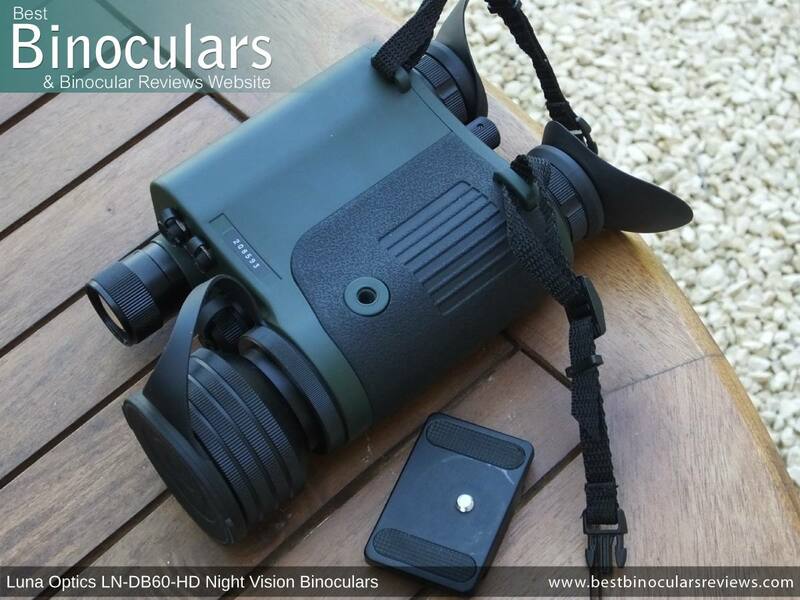 This Luna Optics LN-DB60-HD is a Digital night vision binocular, which differs in many ways to the more traditional analogue tube ones and now that they are able to deliver an image as good and sometimes better than high end Generation III devices, I really do feel they can offer you far better value for your money. Recording: As well as being cheaper, the main advantages these digital devices have over standard NV include the ability to easily record the image produced onto a memory card or transmit directly to a monitor. Range of Use: Not only can they not be used during the day, but accidently exposing a standard NV device with a high-grade intensifier tube to bright light can actually damage it. There is no such concern with most digital NV devices. 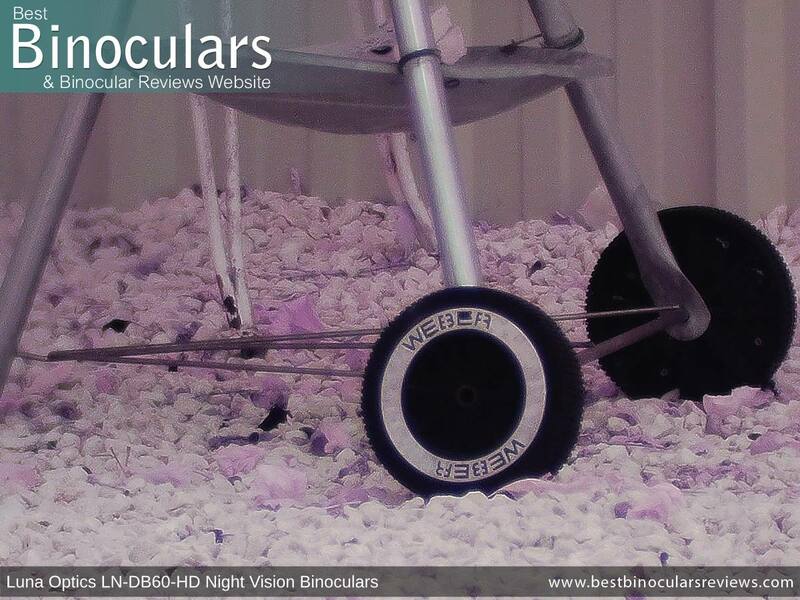 Indeed, some like this LN-DB60-HD is designed so that it can also be operated during daylight hours. 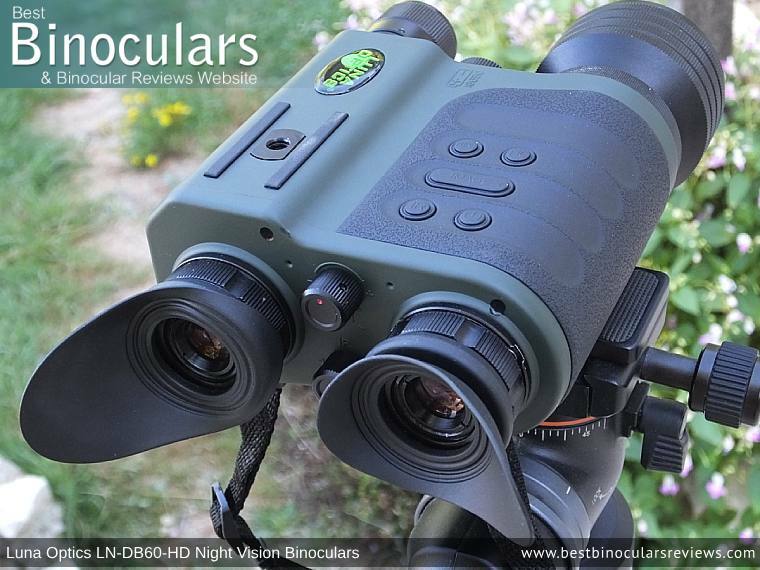 Luna Optics market their LN-DB60-HD as a binocular, but I think a more accurate term is bi-ocular because whilst you do look into them with both eyes, all the available light is collected via a single objective lens as with a monocular and bot two as you get on a binocular. 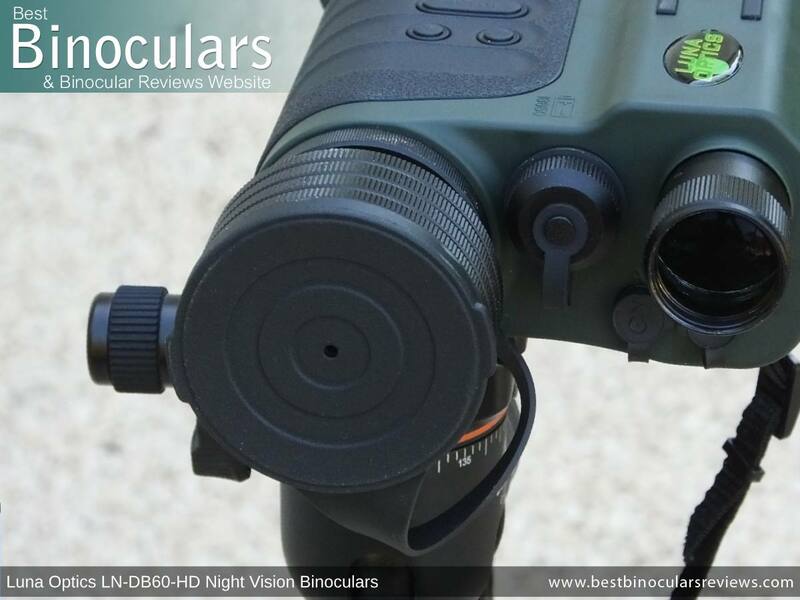 Indeed apart from the double oculars, this LN-DB60-HD is actually very similar to the excellent Luna Optics LN-DM60-HD Digital Night Vision Monocular that I also recently reviewed. The advantages of having two ocular lenses is that it feels far more natural using both eyes and you gain a far more immersive experience from it. On the downside, it is more expensive to make and not as compact. An instrument with two objective lenses is obviously, larger, heavier and more expensive to make. 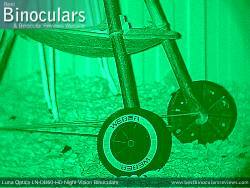 However a true night vision binocular has the advantage in that it is effectively able to collect twice as much light and thus potentially produce a brighter, better quality image. 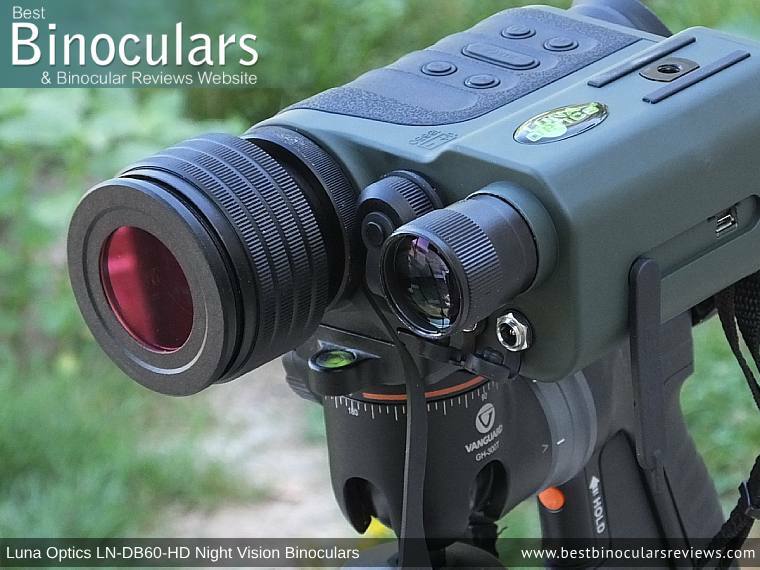 Interestingly and somewhat uniquely these night vision binoculars can be flipped over and used equally effectively either way around. Indeed Luna Optics have incorporated a tripod mounting thread on both the underside and the topside of the unit for you to do just this, although I also suspect that the thread on the top surface is more for mounting the instrument onto a Night Vision Head Mount or an extended range IR Illuminator (like the LN-PB3). So depending on which way you decide to use it, the main controls will either be operated by the fingers on your right hand, or if you flip it over, by using the thumb on your left hand. These buttons are arranged in a small grid and consist of the main on/off switch, a button to turn the IR illuminator on or off, a rocker switch to zoom in and out and then one to start recording video and another to take a photo. With bare fingers, they are easy enough to operate as they are well spaced and easy enough to locate without looking for them. This is important and you do need to become familiar with the layout and what each one does before taking the unit out at night. However what I would like to add is that if you need to wear gloves in cold weather, these buttons have a low profile and are a little small and thus do become quite hard to feel and operate. 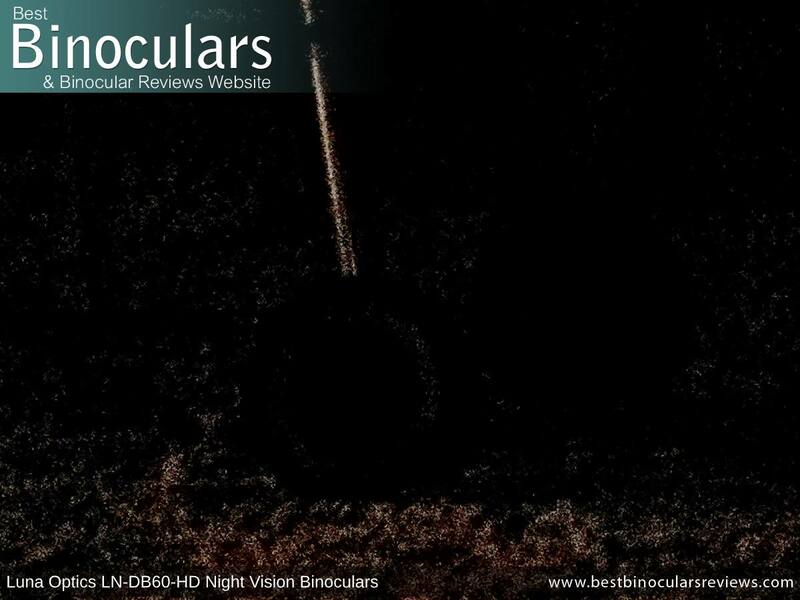 Mounting these LN-DB60- HD night vision binoculars onto a tripod has a number of advantages. Firstly it ensures that you get a completely steady and shake free view, which in terms of recording video and taking photos is very important. It also allows you to more easily share a view with other users, which if you are using the device for uses like astronomy is really useful. As I mentioned earlier, Luna Optics have ensured that it is really straight forward and there are two tripod mounting threads on body. Note that if you mount the device upsidedown, the image automatically rotates around and so you do not have to worry about viewing or recording everything upside down. Whilst you can mount the device upsidedown using the thread on the top of the device, I suspect that the main reason for this being here is so that you can easily head mount the unit for hands free operation. Although as the minimum magnification is 6x, you would not be able to drive or easily walk with them on. Another use for this thread would be to attach an extended range IR Illuminator like the Luna Optics LN-PB3. On the rear of the NV binocular you find the eyecups, eyepieces and the IR and image brightness toggle wheels. 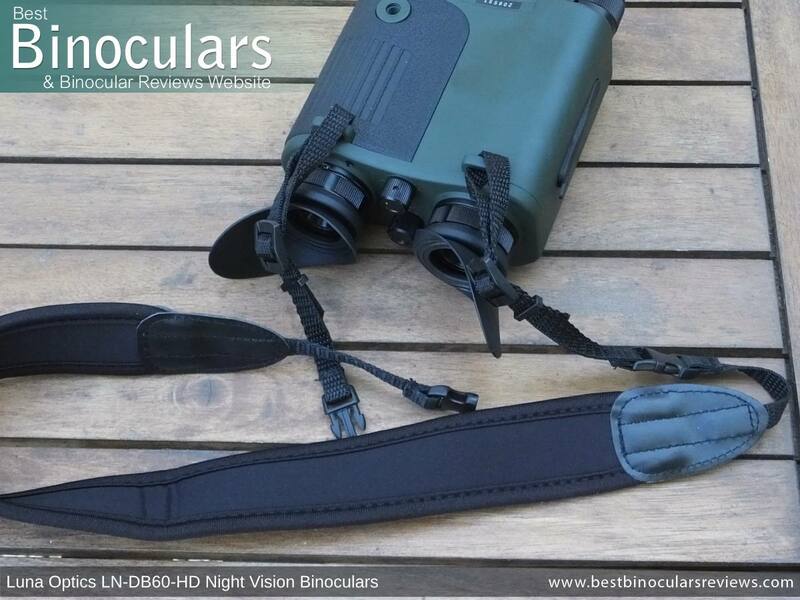 The eyecups on the Luna Optics LN-DB60 HD binoculars are made from a very thin and soft rubber. I really like the eye flap design, similar to eye shields, they really do a great job of blocking out distractions and light sources from the sides of your view, which at night if someone has a torch or there is a light on is really important. Note: These flaps can be rotated around to offer the best fit and if you wish, you can also fold them down and thus out of the way. You can fold these down should you not want to use it, of if you wear glasses. It can also be rotated so that it can accommodate either your left or right eye depending on your preference. 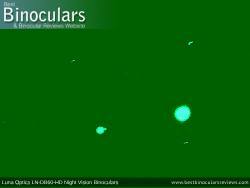 Hardly noticeable are a couple of tiny LED lights located near each of the eyepieces. 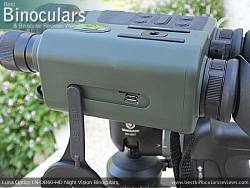 One glows green to show when the NV binoculars are turned on and the other lights up red when the Infrared illuminator is switched on. Note: Their discreet position and small size are deliberate. Firstly it makes sure that they do not interfere with your view and then it also ensures that they do not give away your position, which for some military and security uses this can be vitally important. 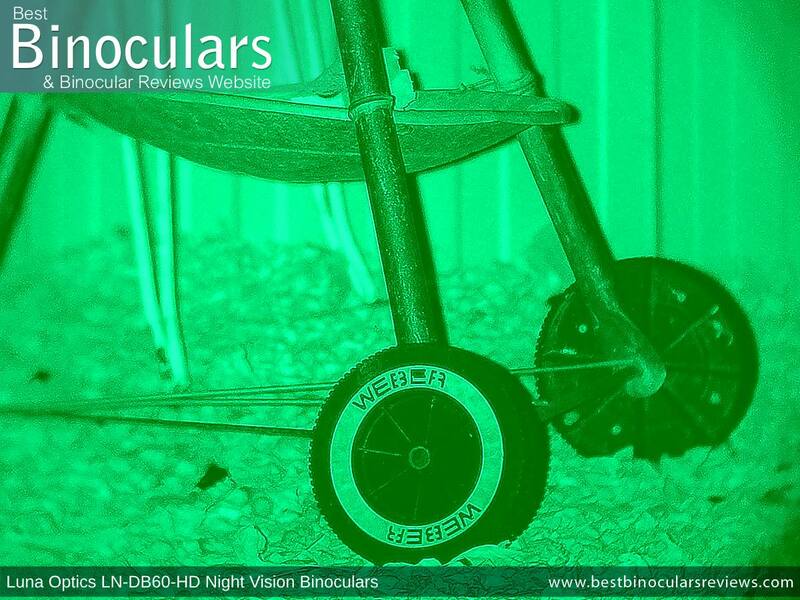 In between the two eyepieces are a couple of wheels, one to adjust image brightness (exposure) and the other to control the brightness of the Infrared illuminator light. These work well enough and are positioned very well making adjusting these settings very straightforward. The main objective lens is located on the right hand side of the front face of the device, then on the left is the smaller lens for the IR illuminator. Both of these can be adjusted and focused by turning the barrels, which I cover later on in the appropriate sections. Access to the battery compartment is on the front face of the LN-DB60-HD, between the objective lens and the IR illuminator. As with most other Luna Optics digital night vision devices that I have tested, this one takes 2 x 3V Lithium (CR123) batteries. Note, it can also apparently run on one 18650 rechargeable battery. A non-rechargeable set is included, but this device does come with a battery charger. So once these are done, it would probably be best to get a set of rechargeable ones. As with just about every other cover, the cap to the battery panel is tethered to make sure you don't misplace it when out in the field in the dark, which I think shows an excellent attention to detail. Just under the IR illuminator are two output ports with tethered rubber covers protecting them. One is a DC output, great for those who use the device over long periods and the other is the video output. On the left side of the device is a covered panel that contains the Memory card and USB ports. The Luna Optics LN-DB60-HD binocular accepts a standard Micro SD card and is where all videos and still images are stored. It comes with an 8GB card included, but should you need more memory, this can be replaced with one with up to 128GB of memory. There is also a USB output and Luna Optics do include a cable which then connects from here and then onto the DC adapter and thus you can use it to power the device or connect it to your laptop or computer to access the files on the memory card. 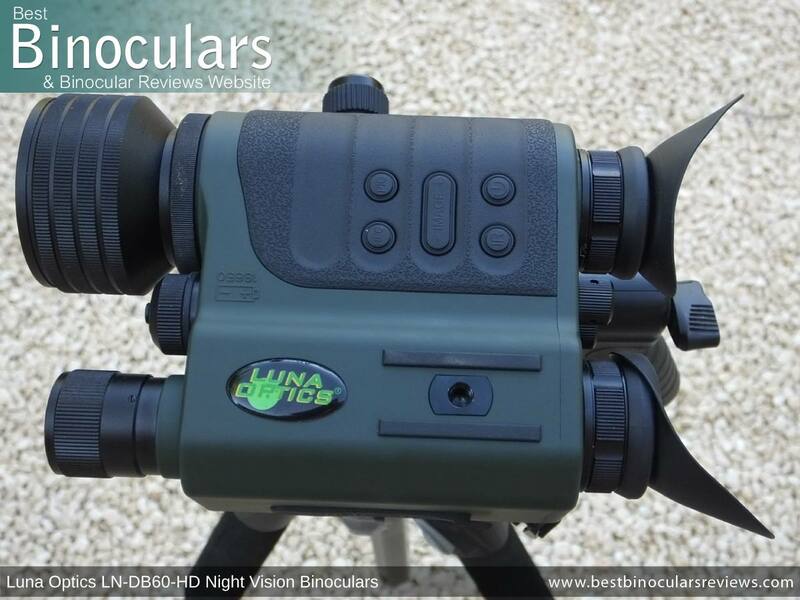 The Luna Optics LN-DB60-HD Night Vision binoculars are not fully waterproof, however, they are advertised as being water-resistant and they say that they can be used in heavy rain. 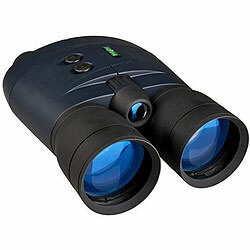 It is important to remember that unlike standard binoculars where you are looking through the instrument, with a night vision device like these, you are viewing a screen. 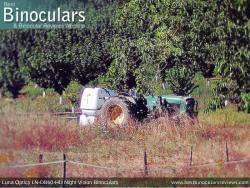 Thus when you set-up the device in preparation for use, the first task is to ensure that each eye-piece is correctly focused onto the screen for your particular eye-sight. This very simple as all you need to do is turn each of the rings on the eyepieces until you view a sharp image with the corresponding eye. 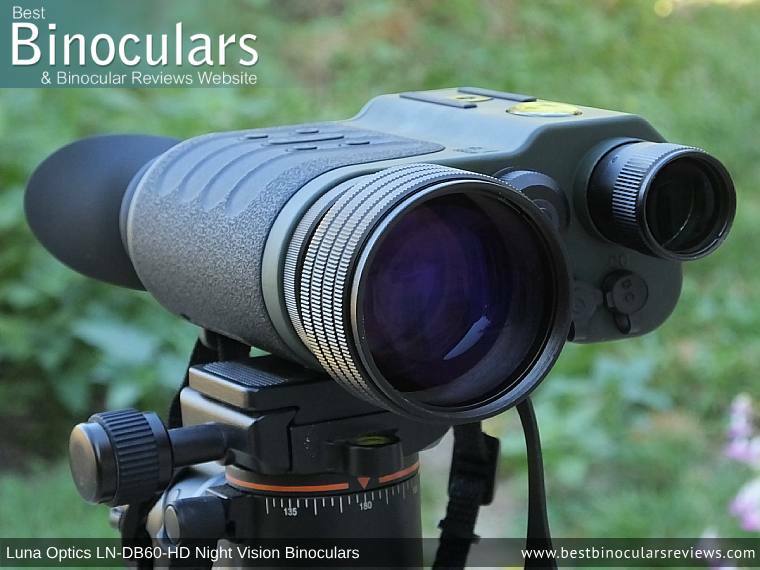 From then all you need to do to focus the Luna Optics LN-DB60-HD binocular onto an objects at different distances is to turn the main objective lens barrel. 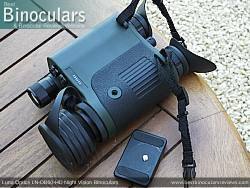 Here once again is another advantage of a monocular or bi-ocular like these over a full binocular as you only need to focus the single lens, whilst with many night vision binoculars, this needs to be done for each lens individually which can at times get a little tedious. 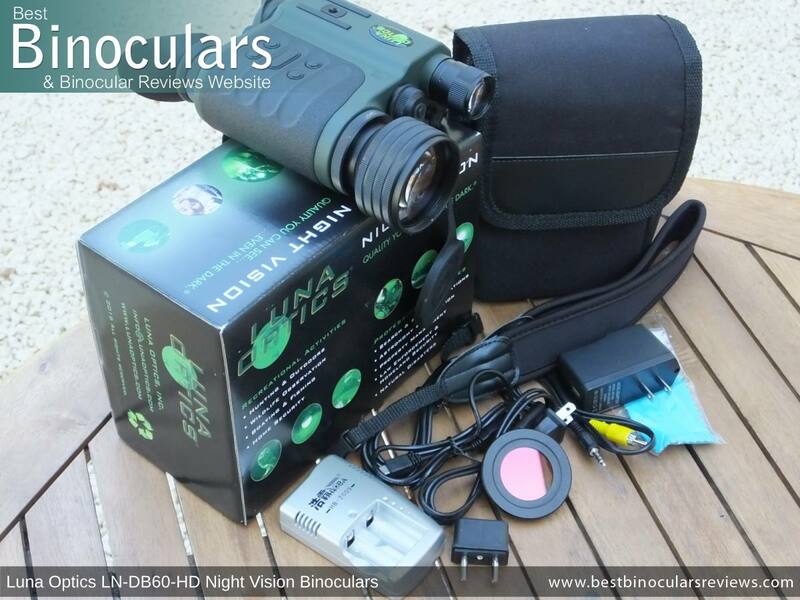 This and many of the other digital night vision binoculars and monoculars from Luna Optics are now able to connect to your WiFi network. This along with the WiFi Action Camera APP enables you to control the device remotely using your Android phone/tablet or your iPhone/iPad. 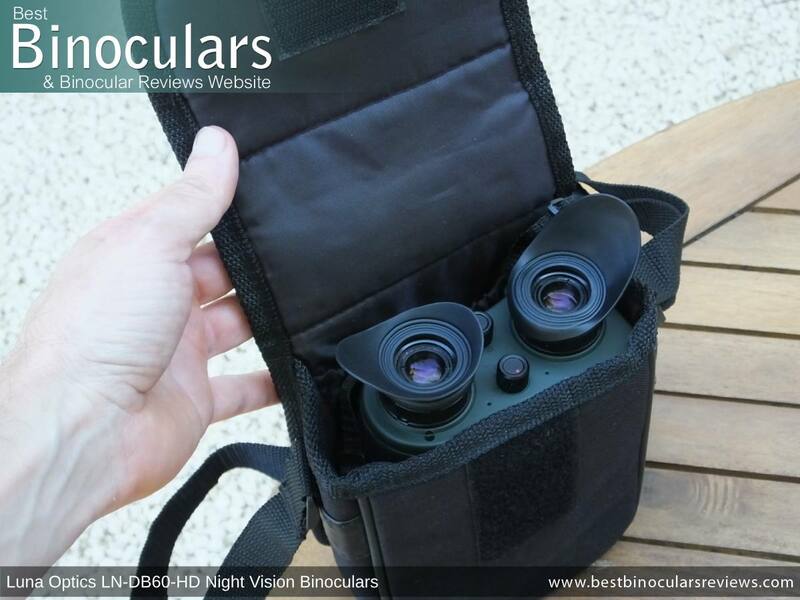 As a rule, Luna Optics don't mention much when describing the optics and the coatings (or lack of) used on their devices and the LN-DB60-HD is no different. Indeed the only information they offer is that they use "precision all-glass optics" and that the system is multi coated. Multicoated optics implies that that some (usually the outer lens surfaces) have multiple coatings of an anti-reflection material applied to them which increases light transmission and thus can offer a better and/or brighter image than devices that use untreated glass, or glass with only a single layer coating. 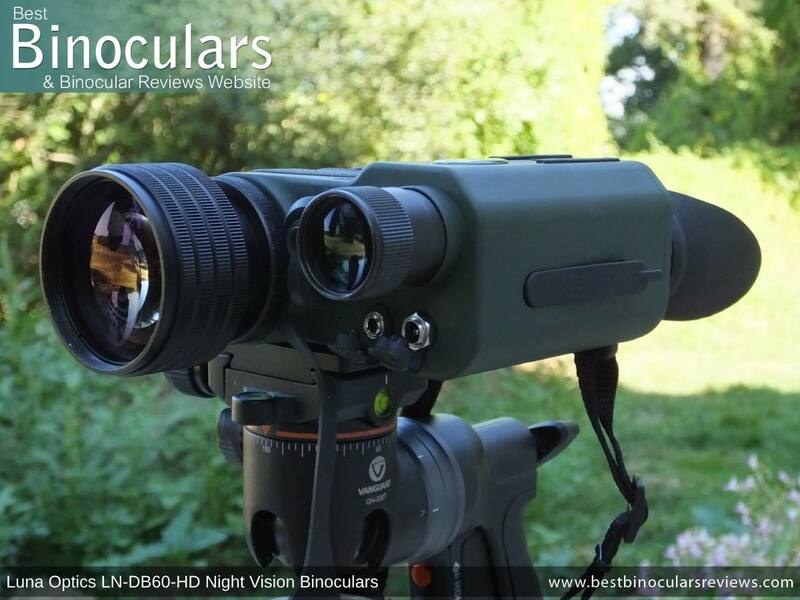 As with the LN-DM60-HD monocular, these have a 50mm diameter objective lens, which offers a good compromise between size and weight and it's light gathering capability. 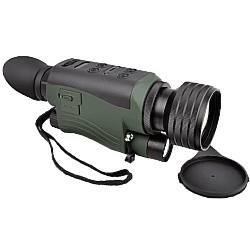 With a 6x optical magnification, these are considered to have a high power for a night vision device. 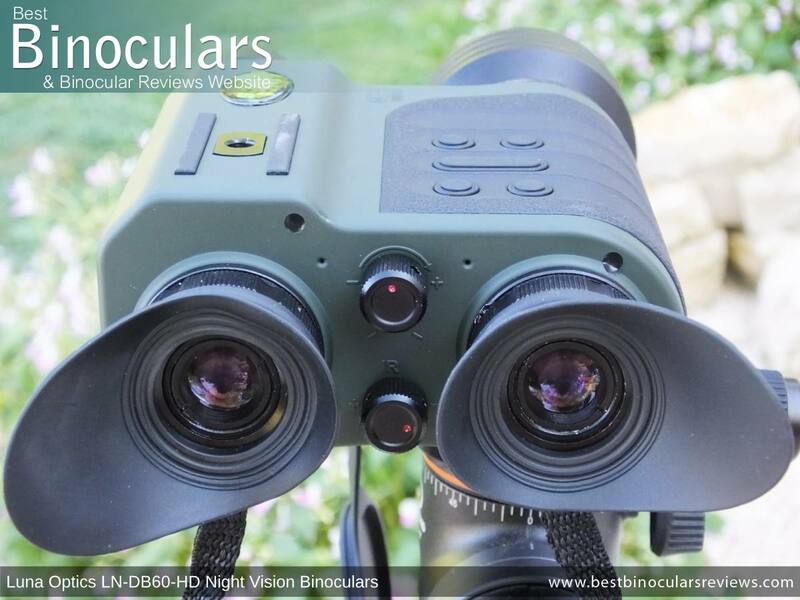 However as well as this, these Luna Optics LN-DB60-HD Night vision binoculars are also able to digitally magnify the image to give you a maximum zoom of 30x, which is extremely high. Although you need to keep in mind that as with any device that magnifies the image digitally, you are going to get some loss in quality. 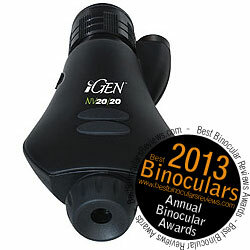 When looking "through" the binoculars you cannot notice this which is great for normal use. However, if you take a photo or video using the digital magnification, you will get some pixilation. At 6x power, the field of view is 7° which for that level of power is good. A wide field of view is important, especially at night and at closer ranges as it makes it much easier for you to locate your subject and then follow it if it happens to be moving. The close focus distance is only 80cm (2.6ft), which is great. I guess for most people this will not be important, but I can imagine there are those who want to study things like frogs or insects at night from very close range. 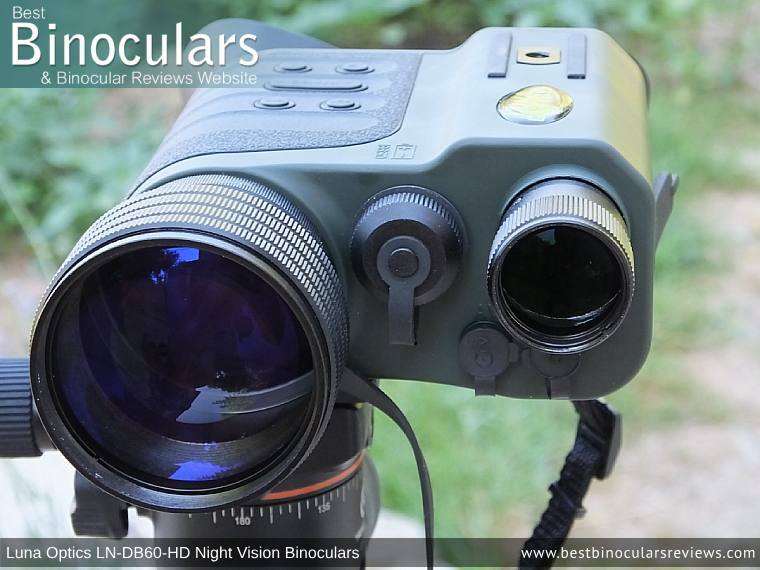 These Luna Optics Night Vision binoculars have an onboard IR (Infrared) illuminator. Positioned next to the objective lens, an IR illuminator basically performs like a torch would for the binoculars, but to our eyes is invisible. So in very dark conditions, when you turn it on, it provides the light source for the device and lights up the scene. I found the one used on this device to be really powerful and worked very well, which you can clearly see in my example photos, but especially in the video below. I assume that it is the same IR as used by Luna Optics on their LN-DM60 monocular, which I was also impressed with. 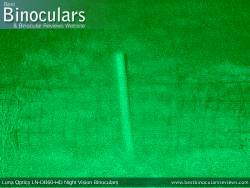 No maximum effective distance is specified, but like the monocular, I found that through testing that it was about 100m. Max Viewing Distance: 200m (656ft) - 600m (1968yft) 200m (656ft) - 600m (1968yft) 250m (820ft) ? 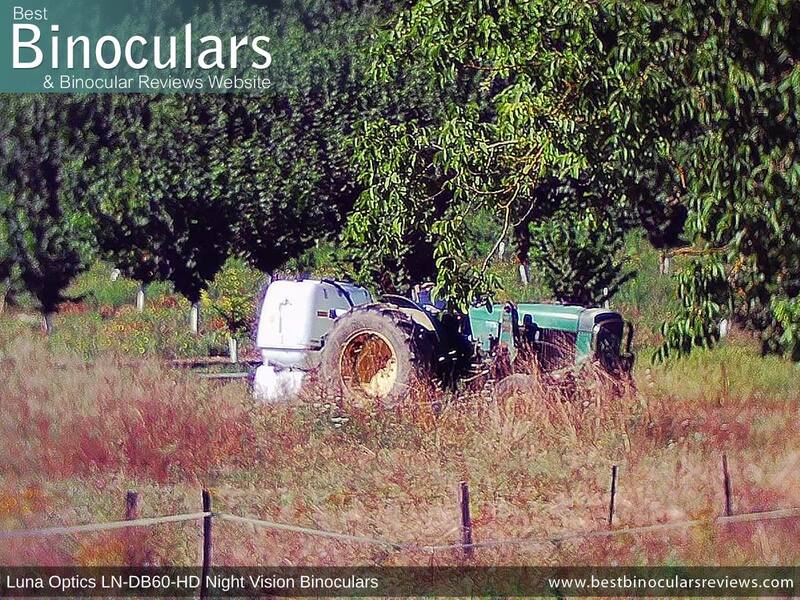 The Luna Optics LN-DB60-HD is able to capture 2.1MP still images in JPEG format with dimensions of 1440x1080. Note: I have not enhanced these images and all I have done is to re-size them and place the BBR logo onto them. (Click on each image to view the full sized version). The couple of examples below were taken in the color setting during the day in good light conditions and with the included color enhancing filter attached to the lens. 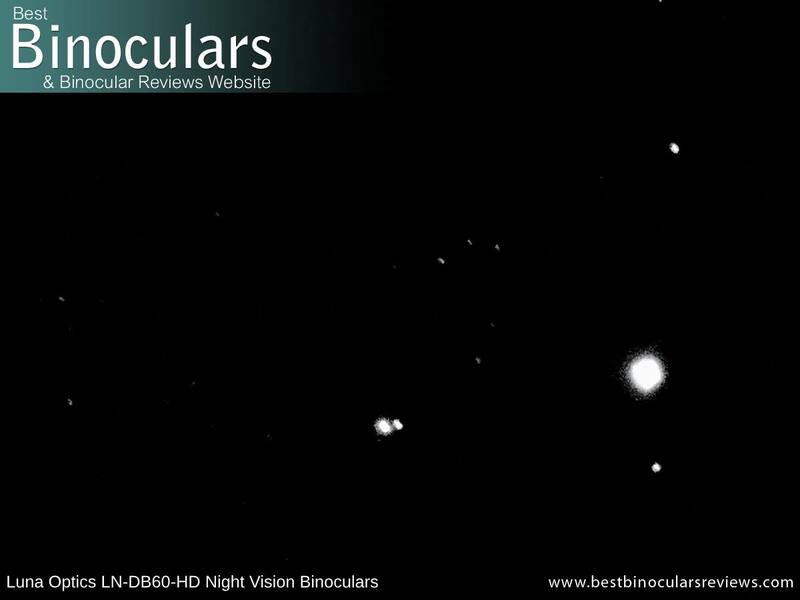 All the examples below were taken with the Luna Optics LN-DB60-HD at night. The night was clear, but very dark. There was a half moon, however it had not yet fully risen and so was not providing much light at all. Light from my house was also minimal and I would say that without the night vision binoculars I had to use a torch to see and move about. It was very dark! For comparison, I once again took some more photos of the Weber BBQ from the same position that I had used during the day, about 15meters from it. 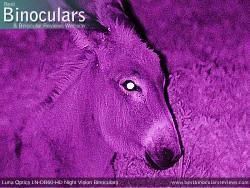 In the first example the photo was captured in full color mode, without the IR illuminator turned on. The second photo is in green screen and once again without the IR on. The third photo is with the IR switched on. Note I had to dial down the intensity as it was at first too bright and the image washed out. 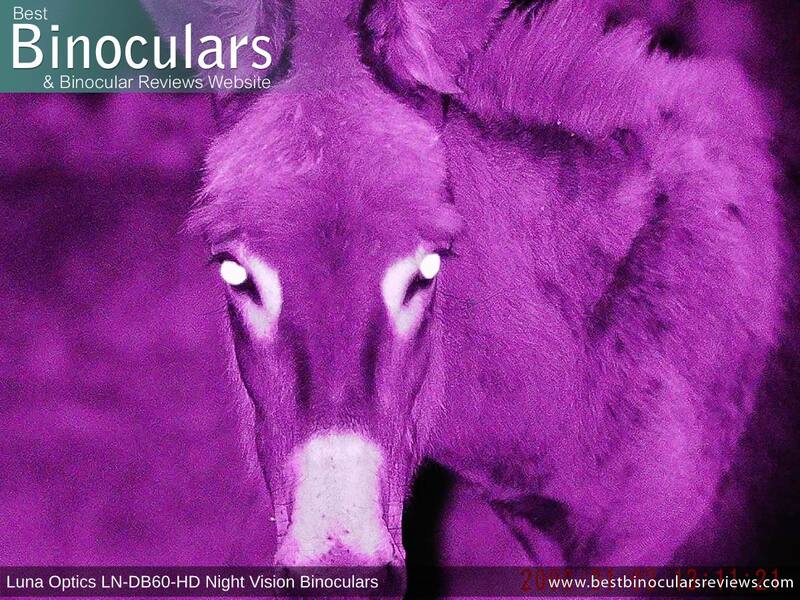 The images of the donkeys were taken in complete darkness using the IR illuminator at a distance of around 10 meters. What really impressed me was the level of detail that I was able to capture. This was even more evident in the video footage that I captured. 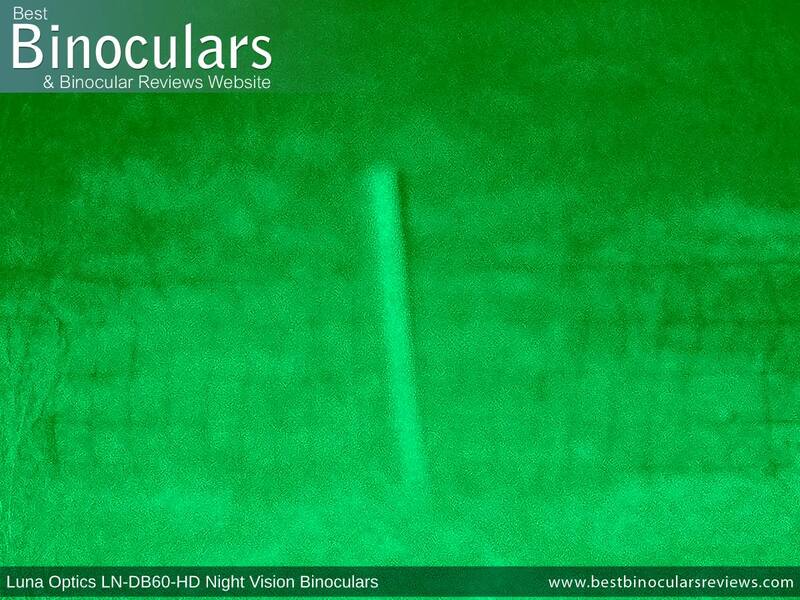 The image of the fence and fence post below was taken at a distance of around 100 meters and using the digital zoom function, which considering how dark it was and the fact that an object is not very reflective is very impressive. 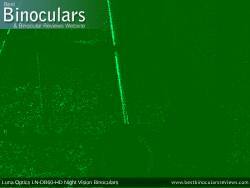 It also shows that the IR (Infrared illuminator) on the Luna Optics LN-DB60-HD night vision binocular can still be effective at that range. The fact that they are so sensitive to light makes using a pair of night vision binoculars for astronomy really interesting. 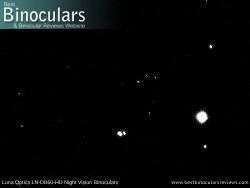 I found that I was able to observe and then easily capture an image or video of far more stars that you can observe with the naked eye. In the images below the largest 'star' is actually the planet Venus. 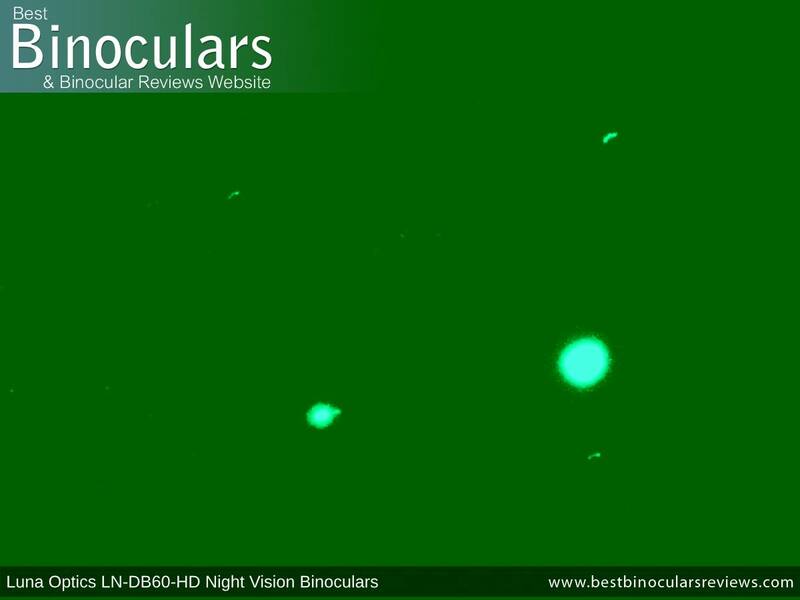 Below is a video of some sample video footage that I took with these Luna Optics LN-DB60-HD Night Vision Binoculars. Also improved on the new LN-DB60-HD is the LCD screen. At .26" 800x640, it is now larger which is good. The objective lens is threaded and thus accepts filters. Luna Optics include a "Color Enhancing Filter" that is intended for use during the day. Without it, the image that is recorded is rather dull and lacks color. As you can see from the sample photos, this really works and is a welcome addition. 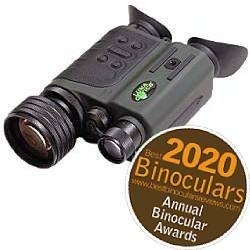 The included carry case is very similar to that with which comes supplied with many standard daytime binoculars. it is fairly well padded and does a good job of protecting the device when not in use. The binoculars fit snugly within it, but not too tightly so as to make replacing it too difficult. On the rear is a belt loop and there is also a separate pocket within the case where you can securely store the cables, adapter and included cleaning cloth. The case also has it's own strap that can be removed via a couple of quick release clips. Like the case, the neck strap is the same as that found on many binoculars. It is well padded and I really like the quick release clips that allows you to detach it very quickly and easily. This really helps if, like me you often swap from using the NV binoculars on a tripod to carrying them about in the field. These clips also mean that it could also very easily be attached to a binocular harness, which for some users, like hunters who may also be carrying about other gear is an excellent idea. The soft rubber objective lens cover easily attaches into the end of the lens, but is secure enough so that it should not fall off too easily by accident. I also like that the cover is tethered to the body of the NV binocular. 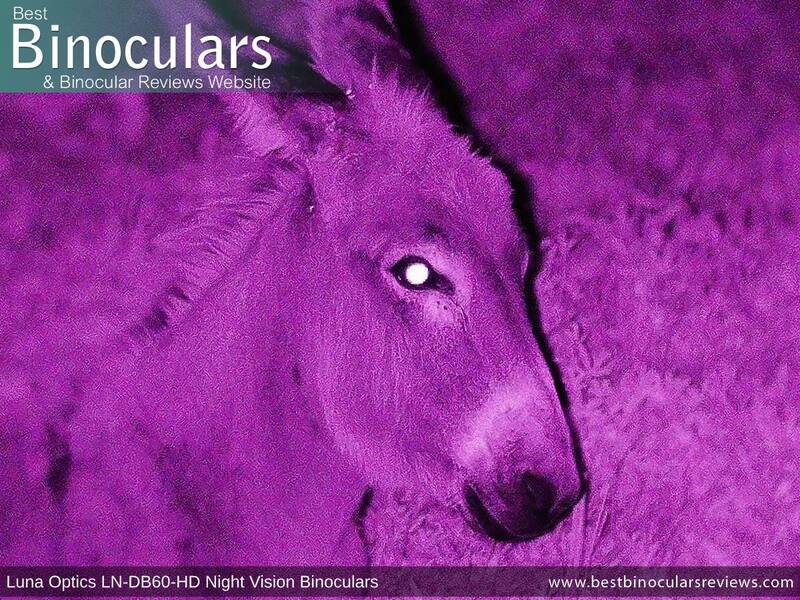 With a daytime binocular this is a nice feature to have, but for a night vision device like this, I think it is essential to ensure that you don't spend all evening scratching around for it in the dark should you accidentally drop it. A cleaning cloth is provided, the quality of it is sufficient for cleaning the body and perhaps very light dusting of the lens when out in the field. 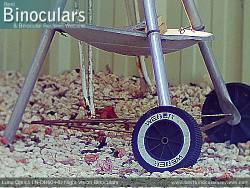 Whilst the included batteries are not rechargeable, Luna Optics do supply the unit with a battery charger. Not something that I would have expected, so is a nice touch. I began this review wondering if the impressive list of features, components and specifications would all come together and deliver on their promise. 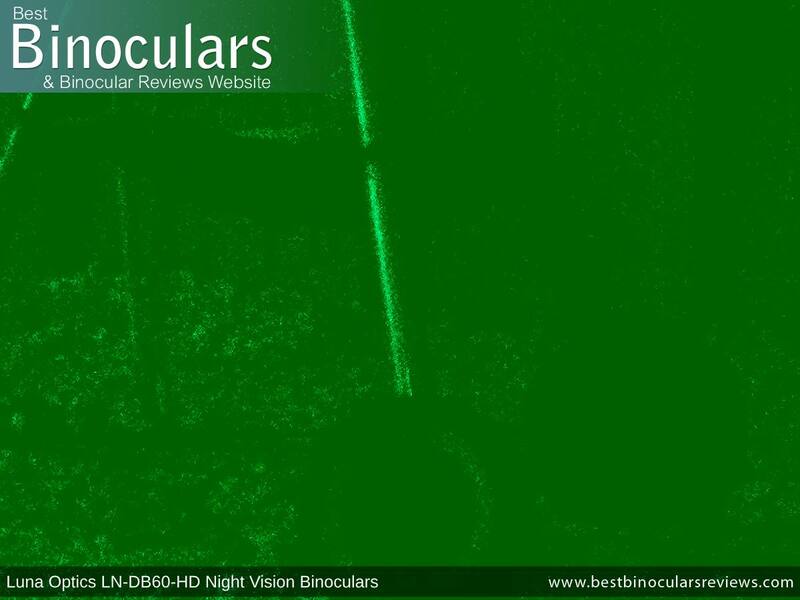 Well I can say that after thoroughly using and testing them, the Luna Optics LN-DB60-HD Digital Night Vision Binocular & Recorder is on the whole a truly excellent night vision device and makes excellent value for money. Strong Points: I found the body comfortable to hold and unless I was wearing gloves the buttons were easy to navigate and use. Indeed I have to say that on the whole I preferred using this device than the very similar LN-DM60-HD monocular as it just felt more natural, easier to operate and I far prefer using both eyes. So unless I specifically needed to keep the weight and size to a minimum, a night vision binocular / bi-ocular would be my choice over a monocular. A real strength of these is the versatility and range of uses that you can get out o them. Being able to view and record in both daylight and at night is great and whilst the daytime quality compared to a video camera is lacking, being able to document what you have seen is fantastic. The performance in very dark conditions is surprisingly good, this is especially the case when you take into consideration the very powerful 6x magnification. 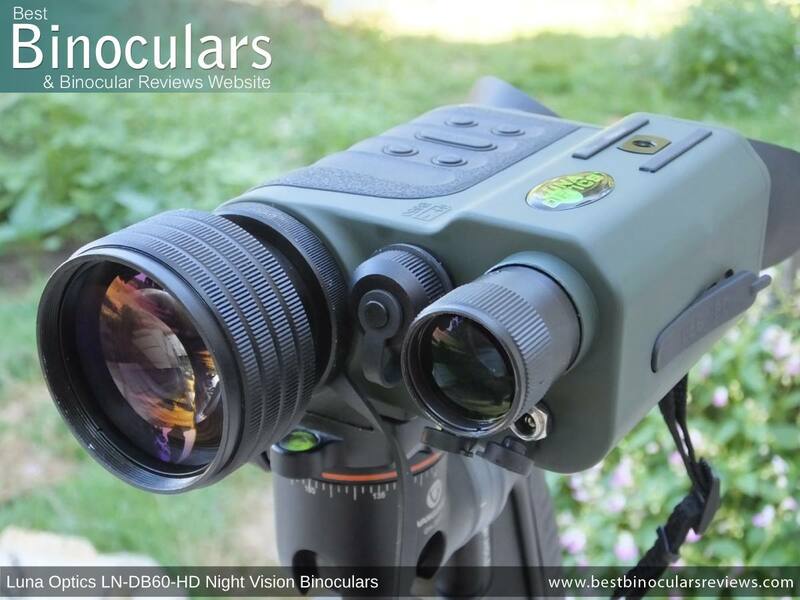 The really powerful IR illuminator on the Luna Optics LN-DB60-HD night vision binocular is also really impressive and matches the power and range of any that I have used in the past. Weaknesses: In winter when you are wearing thick gloves, the buttons are just not pronounced enough and thus quite difficult to locate and use. 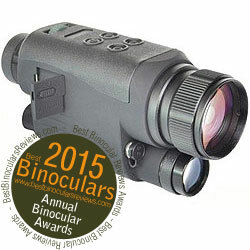 Ideal Uses: The Luna Optics LN-DB60-HD night vision binocular will make an ideal choice for many security related uses. It will also be perfect to take on any camping or wildlife adventure like a like safari and I can also see it been used for night hunting. 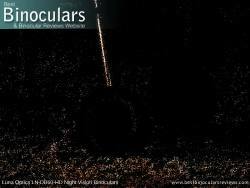 Night vision for astronomy is also becoming more and more popular as they really highlights the stars, making ones that you would never see with the naked eyes jump out at you.